Our club had its beginnings in late 2002 when a number of enthusiastic paddlers, most having been involved with Dragons Abreast, decided that it was time to start a dragon boat club on the Central Coast. A meeting was announced in the local press and the new club was formed initially to be called the “Central Coast Sea Dragons”. Those involved at the outset included Kath Leeson, Julie and Mick Woods, Anne Ditton, Raelene Harley, Robyn and Stuart Purvis-Smith. Kath Leeson became our first president and drove and inspired the club in its early days, along with her husband, Pat, the Club’s first registered sweep. Credit should also be given to those others who assisted the club in its early days, among them members of the Newcastle Hunter Dragon Boat Club and Steven Davidson who dropped in from Sydney to provide valuable coaching to a novice crew. A boat leased from DBNSW miraculously appeared at the Long Jetty Sailing Club and Sunday training commenced on the shallow and treacherous waters of Tuggerah Lake. The Club’s first serious regatta outing was at Darling Harbour in 2003 but the race results are best consigned to the mists of time – it suffices to say that an alternative Club name “The Sea Snails” emerged soon after. 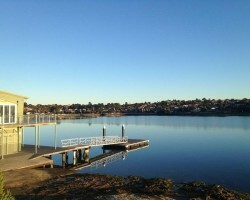 The environment at Long Jetty proved to be inadequate and the Club moved in 2004 to its present location at Toukley where the Volunteer Coastguard base provided a “home” and Budgewoi Lake a better paddling environment. 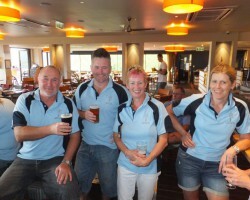 Here, under the presidency of Brian Leedham, the Club held its first DBNSW-sponsored regatta. It was a milestone for the Club but the shallow lake with unpredictable wind conditions again did not provide an optimal racing venue. 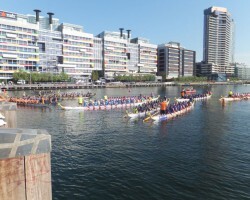 The following year the regatta was moved to a much more paddling-friendly venue on the Wyong River at Tacoma where it has continued to grow in status and popularity. 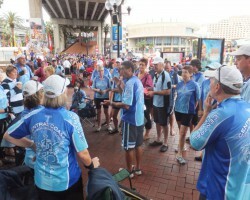 To accommodate the disparate priorities of members, the name of the club was changed to the “Central Coast Dragon Boat Club” with its Sea Dragons and Coastbusters teams better representing the interests of those whose primary aim is fitness and racing and those breast cancer survivors who paddle with a different viewpoint.